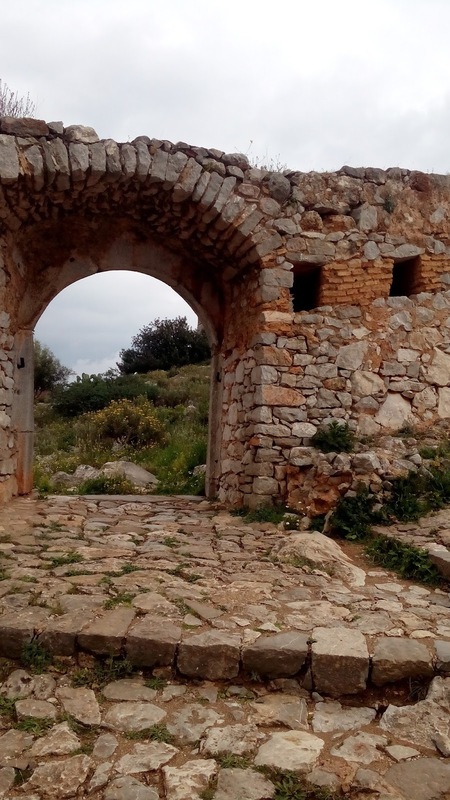 Yesterday, my awesome, fun, visiting friend and I took the party to the Peloponnese. 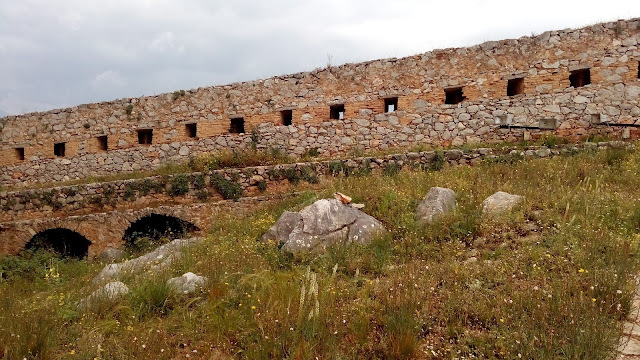 We started in Mycenae, which I feel like I covered really thoroughly in an earlier post. If you don't know what I'm talking about, get out. 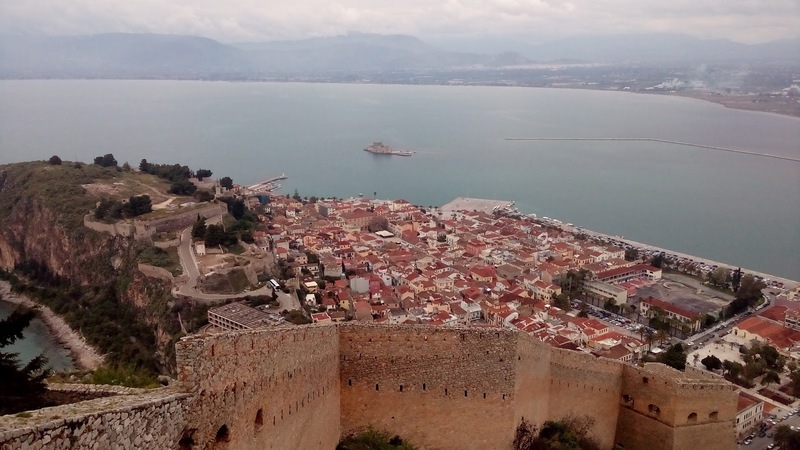 I failed to include some crucial information out of the earlier Nafplio post, so I tried really hard to fill in those blanks for you this time. Like yesterday's post, these photos will be presented with limited captions. I'm so tired, you guys. 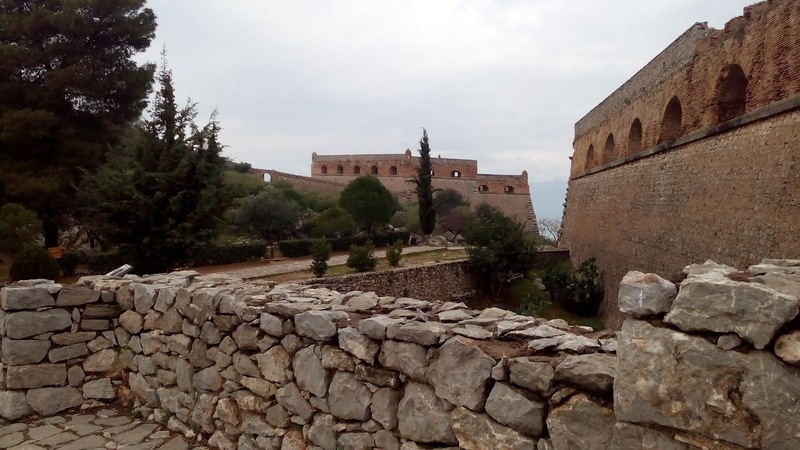 Nafplio has three old Venetian fortresses. The big, tall one on the hill is called Palamidi. Strategically, it was in a great place for defense, but the Venetians lost control of it to the Turks who lost control of it to the Greeks, so it can't have been that wonderful. 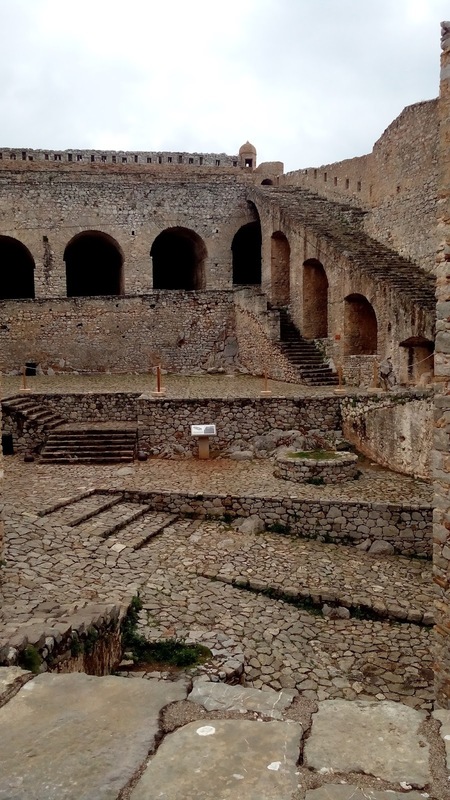 In addition to being a military site, this place was also used as a prison. In our personal history, this was the fortress I couldn't tour when we went to Nafplio before because we'd brought the dog with us. It was fun to go back and see it again for the first time. 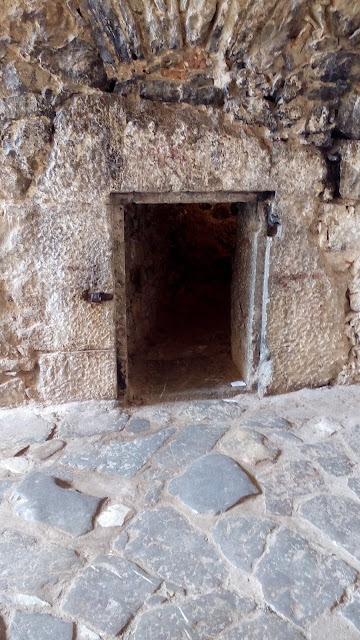 This is the entrance to a prison cell in the fortress. When you go during the high season, you have to wait in line to crawl through the door and take a quick peek. When you go during the low season, you can spend five minutes hanging out in the cell, and then make a video of it for your internet friends. 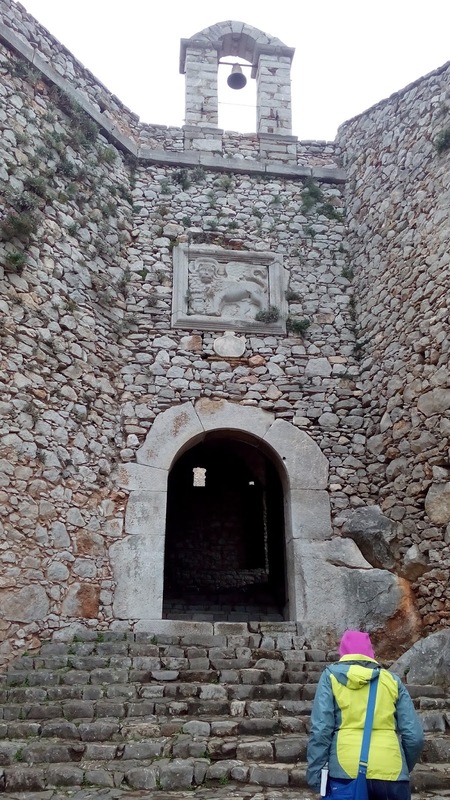 The Turks used Albanian mercenaries in one of their campaigns against the Greeks. 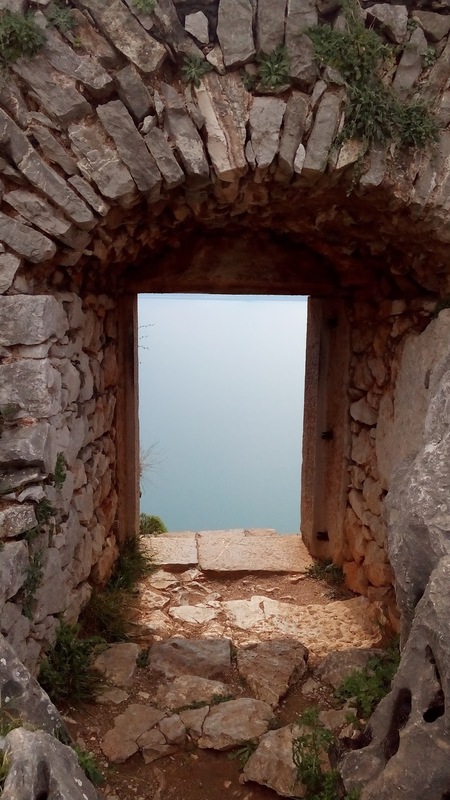 Unable to pay the mercenaries, they lured them up to this little doorway, and shoved the whole lot of them off the cliff. Never be the henchmen. 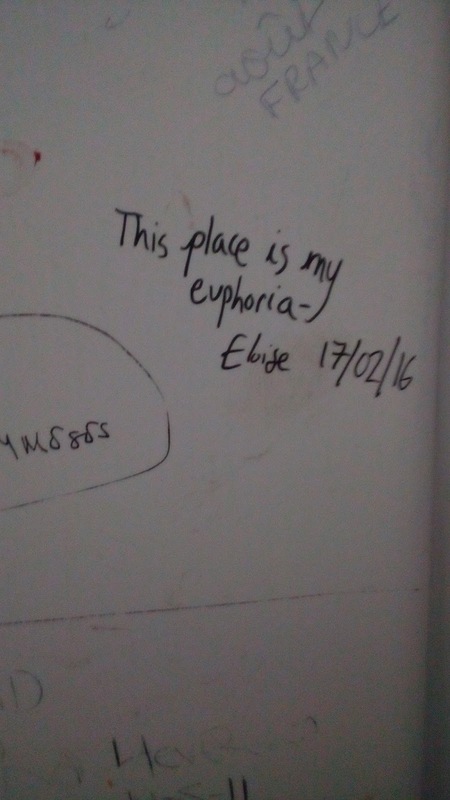 ...as seen in a bathroom stall at the fortress. or maybe she just had a really great bathroom experience. I guess I can relate to that. 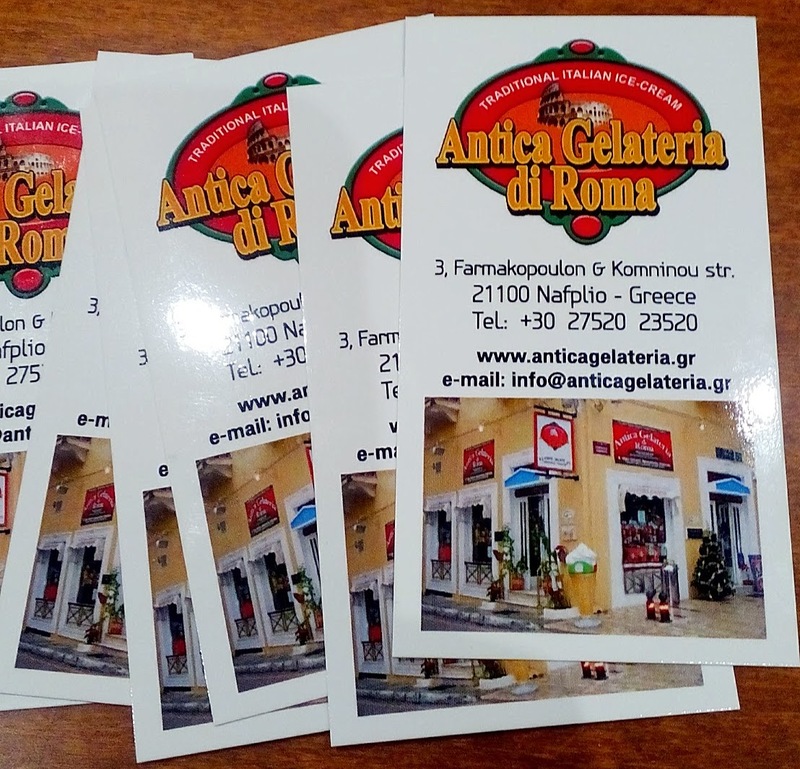 I told you this place is known for having the best gelato in Greece. I forgot to take a picture of it for you last time. Here it is. Chocolate and hazelnut. This one set me back 3.50 euros, and it was worth every last euro cent. 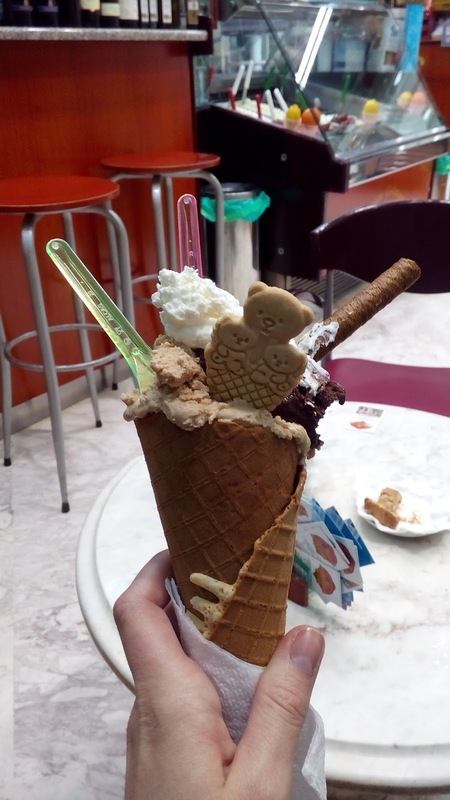 This is the gelato place, recommended by Rick Steves, everyone, and me. The owner, who is delightful, handed me a bunch of business cards and told me to tell my friends to come. We followed along with Rick Steves' walking tour through Nafplio. On the whole, he doesn't sound super jazzed about the city. 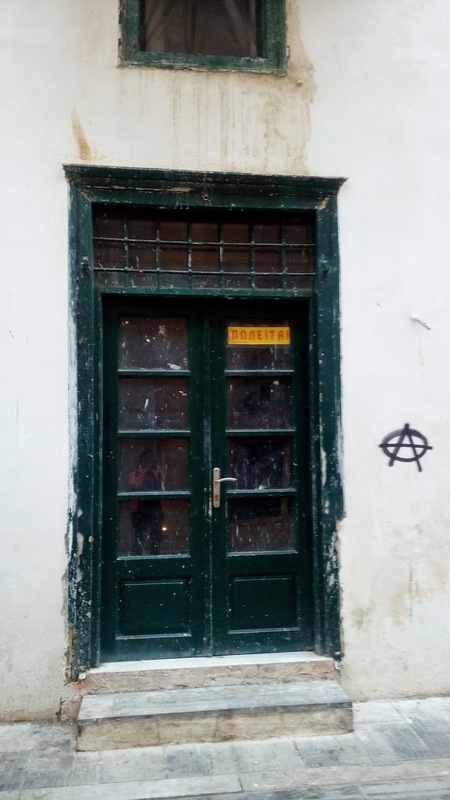 I rarely disagree with the man, but his opinion of certain sites in Greece don't coincide with my own. It's unsettling. 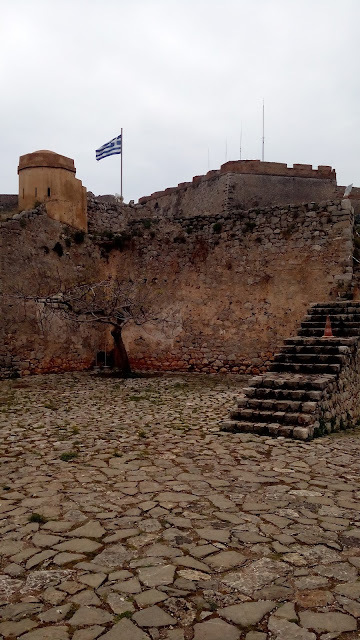 His walking tour through Nafplio was fun. It probably makes more sense in high season, but we enjoyed it in low season. 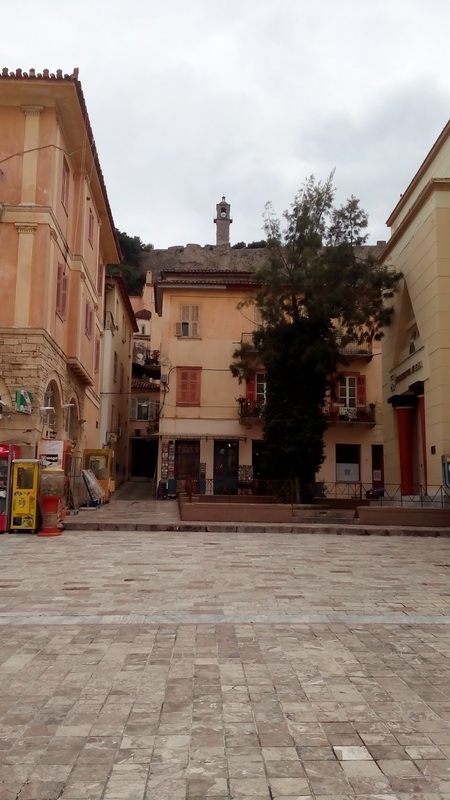 Nafplio's Syntagma Square, with the second largest fortress on the hill. That's the fortress Bella climbed all over. 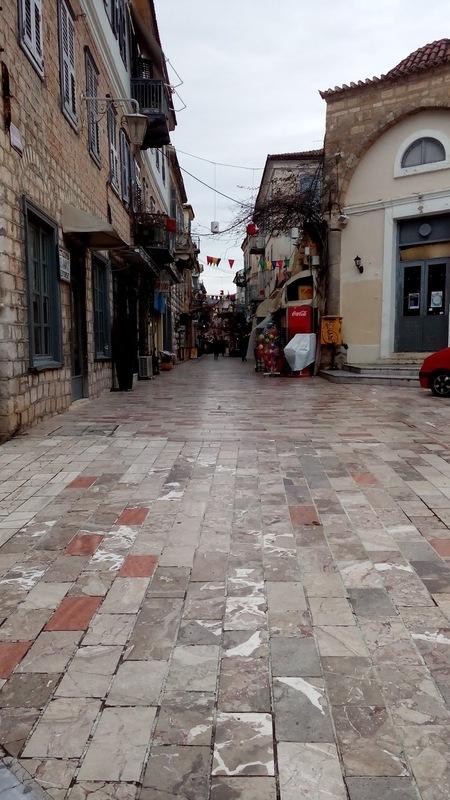 Bustling tourist street, probably, in summer. This is my souvenir from the famous worry bead store. Worry beads are a cultural thing here. They're a string of beads that almost look like a rosary. 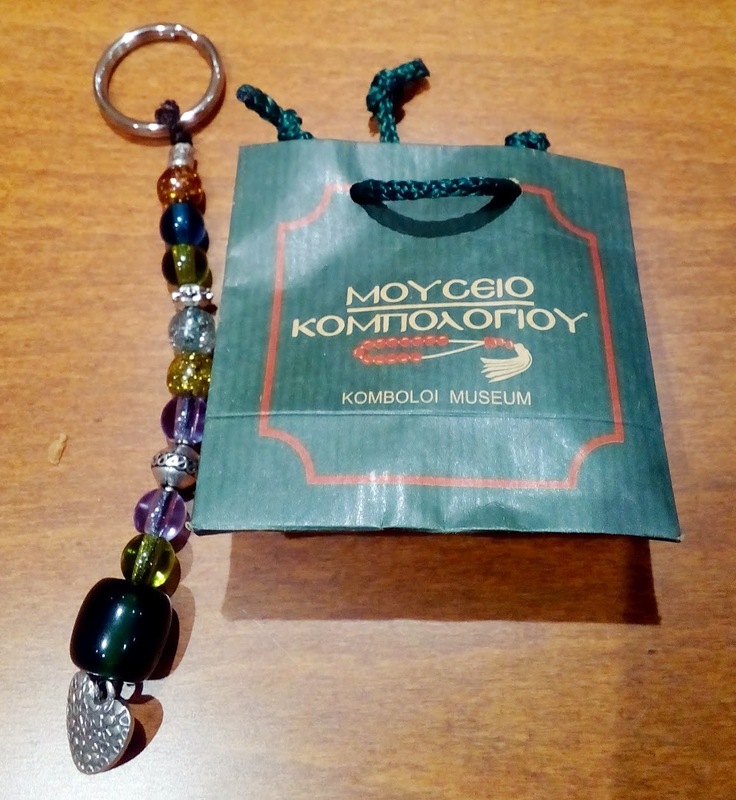 Greeks use them as stress relief by playing with the beads in their hands. It's similar to when I wear any jewelry, and end up playing with it all day. Like, when I play with my wedding ring until it pops off my finger and rolls on the floor under a couch, and I have to crawl on my hands and knees to try to get it, and hope it hasn't fallen down the vent, and then I finally find it, and immediately start playing with it again. I can confirm that I have seen worry beads in real life in our neighborhood, but I assumed the guy was just walking around with his prayer beads (not that I know anything about prayer beads either). One style of the worry beads is the komboli. It's the thing pictured on the bag. What I bought is called a keychain, and you use it to put on your car key so it doesn't get lost in your purse. The doorway to Rick's recommended bakery that has apparently gone under since 2013. We were devastated, until we found another place. 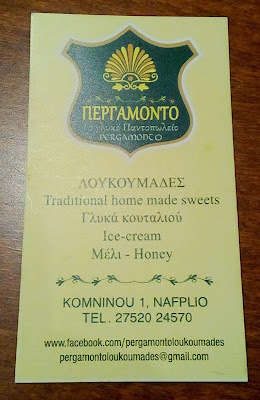 I've told you about Greek donuts, or Loukoumades, before. If you don't remember, I say to you again, get out. After Rick Steves failed to walk us to a bakery, we found our own conveniently located right next door to the gelateria. They shared a wall. 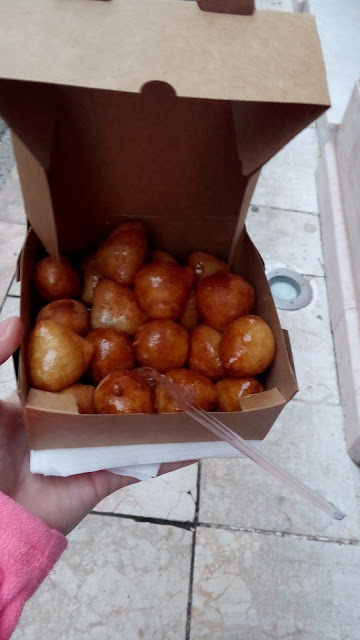 For four euros, we got all these donut holes. They were fried fresh in front of us, and doused with honey and cinnamon. They were puffy, crispy, and heavenly. Here's the name and address of the place. They also asked me to tell my friends how wonderful they are. Friends, go here. Shortly after we got the donuts, it started raining. It was already after 5pm, so we decided to call it a day, and head back to Athens on the toll roads. I'm wondering if I could convince a group of people to split the cost of making a regular 4 hour round trip drive to Nafplio solely for gelato and donuts. I think it's possible.